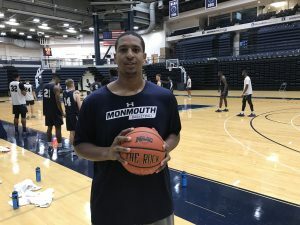 Zac Tillman, a 6 foot 9 inch college graduate is heading to play professional basketball in Georgia (the country). The horn sounds and we both look up at the clock. I look at Zac as he proceeds to enter the court, “Nikkei, I got you!” he says to Monmouth’s freshman. Nikkei energetically hustles to the sideline as Zac enters the college practice. Zac will be leaving for Georgia in less than a week. So he is spending his final days in America where he developed his craft. At the MAC center with the Monmouth Hawks. He signed a contract to play for Olimpi Tbilisi. Zac hanging out at practice before he departs the United States to Georgia. Q: What are your expectations as you head to Georgia to play for your first professional team? A: Im looking forward to the professional lifestyle and a difference culture. Im looking forward to learning new things and improving my skills on the court to help my team win as many games as possible. Q: What are some of the other countries that offered you? A: I received some legitimate offers from Iraq and Cyprus but I received many offers which were too low to take. Q: How long will you be playing in Georgia? A: The league starts October 25th and playoffs start in May so i hope to be there till the end. Q: How long do you plan on playing? A: I Just want to keep playing as long as possible. Q: What do you feel, helped you improve throughout the years? A: My family teammates and coaches helped me become the man I am today. My class that came in, most of us are still playing and really improved during school. Guys like Justin Robinson, Chris Brady, and Jelon Hornbeak.